Astronomers using the new Atacama Large Millimeter/submillimeter Array have imaged a region around a young star where dust particles can grow by clumping together. This is the first time that such a dust trap has been clearly observed and modeled. 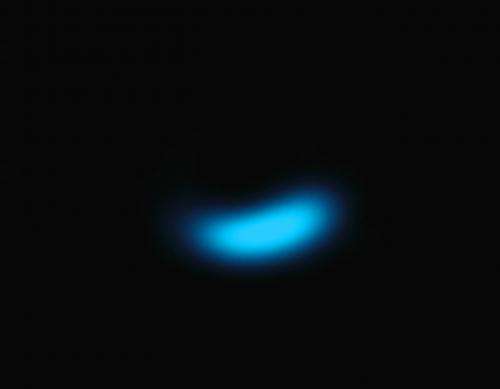 It solves a long-standing mystery about how dust particles in discs grow to larger sizes so that they can eventually form comets, planets and other rocky bodies. Astronomers now know that planets around other stars are plentiful. But they do not fully understand how they form and there are many aspects of the formation of comets, planets and other rocky bodies that remain a mystery. 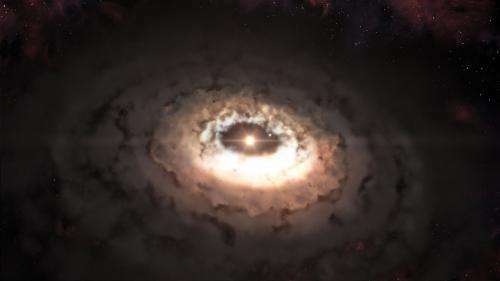 However, new observations exploiting the power of ALMA are now answering one of the biggest questions: how do tiny grains of dust in the disc around a young star grow bigger and bigger—to eventually become rubble, and even boulders well beyond a metre in size? Computer models suggest that dust grains grow when they collide and stick together. However, when these bigger grains collide again at high speed they are often smashed to pieces and sent back to square one. Even when this does not happen, the models show that the larger grains would quickly move inwards because of friction between the dust and gas and fall onto their parent star, leaving no chance that they could grow even further. Somehow the dust needs a safe haven where the particles can continue growing until they are big enough to survive on their own. Such "dust traps" have been proposed, but there was no observational proof of their existence up to now. Nienke van der Marel, a PhD student at Leiden Observatory in the Netherlands, and lead author of the article, was using ALMA along with her co-workers, to study the disc in a system called Oph-IRS 48. They found that the star was circled by a ring of gas with a central hole that was probably created by an unseen planet or companion star. Earlier observations using ESO's Very Large Telescope had already shown that the small dust particles also formed a similar ring structure. But the new ALMA view of where the larger millimetre-sized dust particles were found was very different! "At first the shape of the dust in the image came as a complete surprise to us," says van der Marel. "Instead of the ring we had expected to see, we found a very clear cashew-nut shape! We had to convince ourselves that this feature was real, but the strong signal and sharpness of the ALMA observations left no doubt about the structure. Then we realised what we had found." What had been discovered was a region where bigger dust grains were trapped and could grow much larger by colliding and sticking together. This was a dust trap—just what the theorists were looking for. As van der Marel explains: "It's likely that we are looking at a kind of comet factory as the conditions are right for the particles to grow from millimetre to comet size. The dust is not likely to form full-sized planets at this distance from the star. But in the near future ALMA will be able to observe dust traps closer to their parent stars, where the same mechanisms are at work. Such dust traps really would be the cradles for new-born planets." The dust trap forms as bigger dust particles move in the direction of regions of higher pressure. Computer modelling has shown that such a high pressure region can originate from the motions of the gas at the edge of a gas hole—just like the one found in this disc. "The combination of modelling work and high quality observations of ALMA makes this a unique project", says Cornelis Dullemond from the Institute for Theoretical Astrophysics in Heidelberg, Germany, who is an expert on dust evolution and disc modelling, and a member of the team. "Around the time that these observations were obtained, we were working on models predicting exactly these kinds of structures: a very lucky coincidence." The observations were made while the ALMA array was still being constructed. They made use of the ALMA Band 9 receivers—European-made devices that allow ALMA to create its so far sharpest images. "These observations show that ALMA is capable of delivering transformational science, even with less than half of the full array in use," says Ewine van Dishoeck of the Leiden Observatory, who has been a major contributor to the ALMA project for more than 20 years. "The incredible jump in both sensitivity and image sharpness in Band 9 gives us the opportunity to study basic aspects of planet formation in ways that were simply not possible before." More information: This research was presented in a paper "A major asymmetric dust trap in a transition disk", by van der Marel et al, to appear in the journal Science on 7 June 2013. Where does the rocky dust come from? Sure as hell wasn't an invisible being that transcends time and space. Shoo, troll. Supernovae of previous generations of stars. 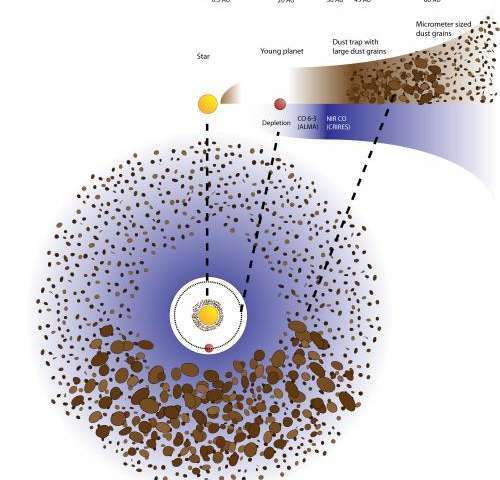 I wonder if our Kuiper belt and Ort cloud formed from such a comet factory, and if so, do they still show signs of the originating dust trap region? Might the Ort cloud be more concentrated in some region or regions left over from this type of feature long ago?